As Dar Suy and Stan Leong from DXC Technology so rightly stated to our June 2018 Blue Prism Café participants, if you polled 1,000 people on what digital transformation means, you’d probably get 1,000 different answers, and they’d probably all be right. To set the stage for how their company – a $25 billion, end-to-end IT services company – helps its clients thrive on change, they define digital transformation as infusing all facets of the business with digital capabilities to accelerate sales and growth, and enable the company to achieve its mission. With that context, they explained that they view RPA software – particularly Blue Prism, because it is truly enterprise-grade, scalable, reusable, and supportable – as a gateway to digital transformation. This is because RPA enables collection of a massive amount of data points that wouldn’t otherwise be available to the company. To harness that power, DXC has built a digital, as-a-service solution they call Agile Process Automation (APA) around Blue Prism. It combines the full, end-to-end value chain of RPA, from domain knowledge through digital capabilities, onto one key platform to identify automation opportunities. It puts the entire Blue Prism stack in the cloud, logs every single event, and in real-time puts every bit of logging information into a process visualizer that lets you see your business process as it’s actually executing. And because it operates in the cloud, it allows the Blue Prism digital workers to be scaled on-demand to meet the needs of clients through a consumption-based model. The real-time analysis of Blue Prism activity enables you to not only improve your business agility, but also measure your business performance and digital transformation ROI. When is a company digitally transformed? DXC looks at five key indicators to gauge the progress being made toward the digital transformation goal. Less Reliance on Past Business Practices: Redesigning processes from the ground up to incorporate automation, instead of automating what’s currently in place, will allow you to achieve your to-be state over time. Improved Integration of Systems: One of the major impediments to digital transformation is issues around the integration of systems. RPA can integrate systems far more quickly than using a traditional IT integration. Greater Business Agility: All the digital initiatives being undertaken to help transform the different facets of the business have one common goal: to keep up with demands in order to content, and stay viable and competitive. Lower Cost of Operations: One of the benefits of having a digital workforce is certainly reduced, and measurable, cost per transaction, or cost of operations. Digital transformations are typically initially managed by a small isolated group. 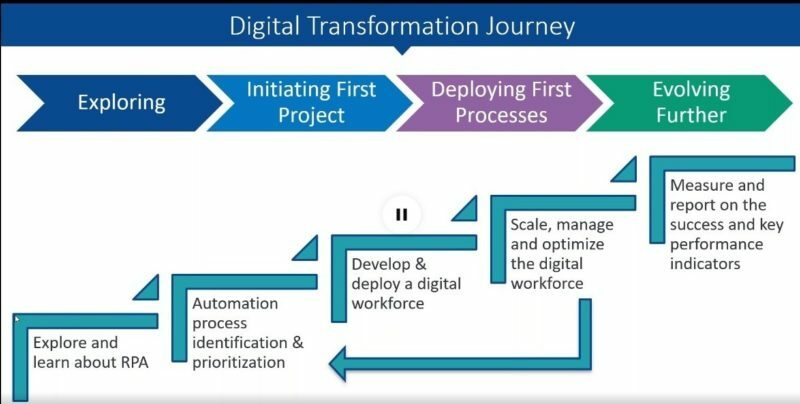 You know your transformation program is on track when everyone in your organization, from the top to the bottom, is thinking about transformation and participating in the efforts, i.e., when you start finding processes cutting across multiple business units and ultimately all the way across the enterprise. To hear more about DXC Technology’s views on how Blue Prism can serve as a gateway to digital transformation, and how it works as the cornerstone of DXC’s agile process automation solution, click here to view the webinar.